Celebrate, collaborate and make memories with McCormick Cafe Catering. With the extended services of McCormick Cafe Catering and three unique venues, we are ready to bring your event to life here or at any meeting space around Billings! McCormick Cafe Catering provides affordable, freshly-created meals and service for private parties, events, company meetings, celebrations and holiday gatherings. Whether your event is at our place or yours, your event is unique. Exciting menus, unparalleled attention to detail and flawless execution make all the difference. McCormick Cafe Catering will walk you through the entire planning and ordering process to make sure the menu, from hors D’oeuvres to dessert, is perfect for your event. We listen and offer suggestions and expertise to ensure that your event or party, no matter what the size or theme, is spectacular. You may want to first consider the style of event or party you have in mind. We want you to relax and enjoy the occasion. McCormick Cafe Catering provides servers and chefs to make your special event flow smoothly at all of our venues. Our staff is courteous and professional and will make every effort to attend to your needs and the needs of your guests. You decide what you’d like to make available to your guests. We have a large selection of wines from a clean and crisp pinot grigio great for a summer afternoon to a big full-bodied merlot to warm up a winter night. McCormick CafeCatering can help with ideas, quantities and suggestions. We celebrate professionalism in our workplace too. You can count on McCormick Cafe Catering to add polish to any event. We look forward to building long-standing relationships with companies old and new throughout Billings- from catering employee lunches to celebrating milestone achievements and holiday parties. We can deliver everything you need to you location or you can use any one of our venues for a quiet uninterrupted meeting with impeccable service. McCormick Cafe Catering offers so many choices for your party; delicious and affordable menus, three great venues, or the option to have your freshly prepared menu items readied for delivery or pickup. And while our experience guarantees our attention to detail, your personal touches are the main ingredient in your event. Whether it’s integrating your favorite family recipe into the menu or creating a seasonal vegetarian dish, we’ll make the event memorable with fabulous food. McCormick Cafe Catering knows how to bring joy to the season! 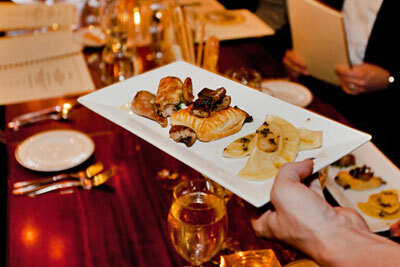 Enjoy the party you are hosting without having to worry about serving the next course. Relax and enjoy your co-workers or guests. Share in the spirit of season by coming down to historic Montana Avenue and let our team at McCormick Cafe Catering create a festive atmosphere and exciting menu. Alternatively, we can deliver your party menu items anywhere in the Billings area. Pick up delicious sandwiches, fresh salads, desserts and sack lunches. Call in the morning and we’ll have it ready for lunch! Check out our menu.